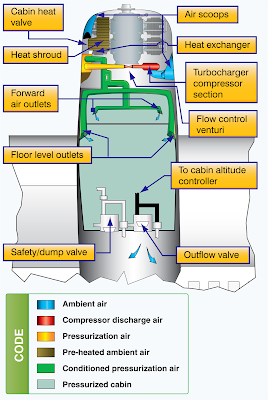 Several instruments are used in conjunction with the pressurization controller. The cabin differential pressure gauge indicates the difference between inside and outside pressure. This gauge should be monitored to assure that the cabin does not exceed the maximum allowable differential pressure. A cabin altimeter is also provided as a check on the performance of the system. In some cases, these two instruments are combined into one. A third instrument indicates the cabin rate of climb or descent. A cabin rate-of-climb instrument and a cabin altimeter are illustrated in Figure 3.